The sigh of relief was palpable as our car crossed the border from the Congo into Rwanda. I’ve told many people that there is a demonic spirit of oppression that lies over this country, similar to what grips Nigeria. We could feel the instant relief as we crossed the river. While that may cause some to want to stay away from the Congo, it strikes me as a spiritual call to action. Yes, this is a really hard place to minister in. There is a constant push to get money out of you, almost ingrained into their culture. Couple that with an unrelenting pushy attitude to get what they want regardless of whatever you say. I don’t even think they see it in themselves, it is so ingrained in the way they are, but it sure makes you want to scream sometimes. But in the midst of the crowds, there are heroes. They get you. They fully understand that the Church has diminished into a hollow structure, echoing the glory from 40 years ago in a vain attempt to convince themselves that everything is good. They know how badly they need revival and are desperate for the messages that I bring. Others are shaken to the core with the message (it is a very hard message), because they readily admit that they know it is true and that they have been coasting on the ripples of the last move of God. They finally realize how much trouble they are in. So why is there such an oppressive spiritual cloud hanging over this place? I know that a lot of the answer lies in the 15-year war that has cause over 5 million dead, untold thousands raped and tortured, and an entire generation warped with pain. Corruption and hate are the two ugly children that are birthed from horrors such as that. But perhaps there is more to it. Maybe Satan is scared of what might happen here and is doing his ugly best to keep the Spirit of God from piercing the darkness. Could it be that all that pain might be a catalyst to break up the fallow ground to create a fertile soil for the Gospel to take root and grow? Is this a place where God’s mercy becomes magnified? He spends a lot of time talking about how much He loves widows and orphans. Well, there are plenty of both here. This place is rich with opportunities for God to bestow His mercy. So, instead of running to easier venues like Kenya or Rwanda, should we instead be like the FDNY firemen who rushed into the Twin Towers while everyone else was trying to get out? They gave their lives so others might live. Is that not what we are called to? We saw mighty outpourings here in service after service that those in the sedate churches in the West have not experienced in over a generation. Many received healing miracles, including two old women who were crippled but can now walk. Others received the Baptism of the Holy Spirit in tongues during the altar calls. Is this not evidence of the heart of God? And if this is where His heart is, should not ours, in spite of the difficulties, be here also? Bukavu. Sounds like a place out of a children’s fairy tale, but it is real enough. Carved out of volcanic rock, the city spills over steep hills and narrow inlets hugging around Lake Kivu like a child hugging its’ mothers leg. There are well over a million people here, scrabbling out a living on the busy, clamorous streets that are lined with kiosks, street vendors and stores that are little more than small caves in the long line of buildings. Bukavu is a riot of activity and squalor, but there seems to be a rhythm beneath the surface that keeps it humming. I enjoy the buzz of the constant activity even though it is coated in a ubiquitous layer of dirt. It almost feels like the streets are alive, like a beating pulse of the city. Bukavu is on the other side of the lake from Goma and has a completely different feel to it. While it may be dirty and clamorous, it has none of the dingy feeling that made Goma so dismal. It should be a small wonder that the difference is reflected in the attitudes of the people here. Maybe it’s just my imagination, but services here seem to be much more vibrant and alive and the people much more responsive. I preach a hard message, to be sure, but it is what is necessary to break the outer shell of “church as usual” that has encapsulated our churches. The vibrancy and fire they once had has turned to embers, some not even glowing. To break through that, there has to be repentance – not the superficial kind that keeps us sitting in our pews, but the heartbroken kind that forces us to our knees. To rip away the cloak of mediocrity takes a strong message. Every place I have been acknowledge the truth of the message I bring – it’s hard not to when the anointing of the Holy Spirit is flowing – but not every church takes the message to heart. Some will; some won’t. Here in Bukavu, they get it; I’m not so sure about Goma. I spent my first three days at a small church with a raucous crowd. They were alive and shouting! They were so thankful for the message that they kept calling the pastor into the night to tell him so. Will they go to the streets and start reaping the lost? I believe they will. Now I am at another church with a large congregation and several satellite churches. There is a notable difference here that can be felt as soon as they start singing. The Spirit of God is flowing here; you can feel it sweep you away in praise as the music takes you from one song to the next. The Congolese can really sing! The first night, I felt energized throughout the message and then called for prayer. And pray they did – loud and with passion for almost 30 minutes! They just couldn’t stop. During that prayer, some people actually received the Baptism of the Holy Ghost with tongues. Yesterday, it was the same, but this time after they prayed they wanted a healing line. The Spirit of God was moving and they wanted more. There are times when you pray and not feel anything. You just sort of hope something happens. This wasn’t one of those times. I don’t know how it is for anyone else, but for me, when the oil is flowing it feels like a gentle flowing of thick oil. It’s hard to describe, but that’s what happened last night. I know at least one old lady who was crippled and could not walk without a walking stick, told me that she was now healed. I suspect I will hear more testimonies when I return tonight. The Congo is a hard place. The suffering they have gone through is terrible, the conditions are stark, and life is hard. It’s not hard to see why so few evangelists, especially from the West, ever come here. But these are the kinds of places where the mercy of God really shines. I’m glad I’m here – I’ll be more than ready to leave when it’s time, but I’m glad I am here to take part in what God is doing here. It’s been a couple of weeks since I have written. We’ve experienced two weeks of difficulties and stress, but we are through that now and heading down the next leg of our journey. I spent 10 days in Goma, DRC, a dreary place carved out of volcanic rock with a stark perspective of life. Goma sits in the shadow of a huge live volcano that is still spewing smoke that lies over the city in an acrid haze. Why people would live here is beyond me, but they do, and they reflect the dreariness and drudgery that the volcano projects on their city. Jealousy amongst the different churches runs high. On the surface, they all want to help each other in the quest for a real move of God, but beneath the pleasantries runs a constant current of maneuverings to get the Muzumgu (white man) to preach at their church. I don’t know if it is part prestige and part honest desire for revival, but it is certainly an ongoing competition between them. They beg me to come to their church, but they won’t even pay for the gas to get me there. Instead one church hands me a $300 car rental bill for the morning services and then the other church wants to be paid another $300 for the car that takes me to the afternoon services. It never stops. This is the Congo, and there is an unrelenting drive for money ingrained in their psyche. This is the stress we have to deal with whenever we come here. But services were terrific … at least on the surface. One old woman who was crippled got healed the very first day, so that got everyone’s attention. The excitement always runs wild, but then, this is an emotional culture. They do have a genuine hunger for God, but the proof will be to see what will happen after I am gone. In many places we have been and planted our seeds of revival, we will hear later how the churches grew so fast that they had to build a 2nd and a 3rd church, sometimes more, to accommodate all the people who were getting saved. Time and time again, pastors would plant sometimes up to 70 churches based on the message they read in our booklet, “Four Steps to Revival”. But sometimes, they just sit there and do nothing, waiting for revival to drop out of the sky on them … or for Brother Dale to come back next year and preach the same message to them again. Some will; some won’t. You just never know. 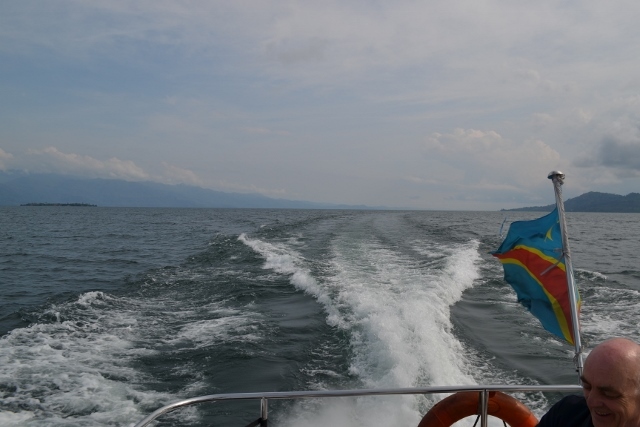 After a 2 ½ hour boat ride, we have now come to Bukavu. I have spent three days here in a loud, jumping-up-and-down, exciting church that was planted by a pastor I met in a bank last year. Like the widow with the Unjust Judge, he never quit haranguing me to come to his church until I finally agreed. I am glad I did. If the seeds of revival were ever planted in fertile ground, his church is it. Unlike so many times when I just don’t have enough time, I was able to go over the Practical Steps on things to do. They ate it up. I have to believe that the Lord led me in that direction and made time for that because they will actually go out and do it. And if they do it, it will work. One more week here before I head for Rwanda. They have this week packed with places to preach at, both me and Cindy. I am in the hands of a man of God whom I have an enormous amount of respect for and who shares my vision for revival down to the details. I fully expect a fruitful and exhilarating week. Black volcanic rock. That’s Goma. The roads are made of it, the houses, the walls, and yards, everything. The streets are littered with piles of jagged black boulders that create a depressing backdrop for this dingy city on the edge of western Congo. I’ve been told that the climate and topography of a place defines to a certain extent the personalities of the people who live in it. It sure seems to be true here. There is little joy, color, or laughter found here – not quite the grimness you find in Nigeria, but sort of a subdued submission to a colorless existence … like the color of the rock this city is built from. As in any place here in Africa, there are strong believers of faith and passion here, interspersed throughout. They are the ones for whom I have come. Many remember the great move of the Spirit that swept across Africa in the early ‘70’s but that zeal had been bridled by denominational control. I suppose the fear that the fire would turn into wildfire and veer from the true tenets of the Gospel caused them to clamp down on how Christianity should be dictated, administered, and preached. I was forged in the fires of that same revival in the ‘70’s, but I was never had to conform to the constrictions of the Assemblies, the Pentecostals, the Baptists, or any of the other well-meaning denominations that tried to piggyback on that move of the Holy Ghost. I guess I just never learned any religious social graces, so I preach it the same way I got it preached to me 45 years ago. There is something about the anointing of the Holy Ghost that trumps all that theological stuff. When the Spirit of God is running – and I mean running hard – nobody cares what the rules are. They just want a piece of that anointing. That’s what I am finding here. There are people here who tell me that they have seen my face in a dream or vision or something like that long before I got here, that the Lord had told several of them that I was coming and bringing revival with me long before I had decided to come. I never know what to think about that kind of stuff, whether it’s over-active imaginations or projected hope, or if the Lord really did tell them that. Don’t know. What is important, however, is that THEY think He did, so they pack into the church to listen to the prophet that God has sent to bring revival. They scramble to get a copy of “Four Steps to Revival” and devour it. The hungry look on their faces and the feeling of desperate hope in the air stands in stark contrast to the black volcanic rock that surrounds them. I don’t know what will happen here after I have left. If they take the message to heart, then they will see God move; if not, then it will be back to “church as usual”. That’s not for me to stress over – my job is to deliver the message that the Lord has given me, to deliver it in the Spirit, under the power of the Anointing, and with the passion of the Holy Ghost flowing through me. They will make their decision from that. Steve Hill has died. I wonder it that ever hit the national press. Should have, but probably didn’t. Steve was the firebrand behind the Brownsville Revival in Pensacola. Millions came through those doors to touch the anointing that had fallen on that church and took whatever residue they could to their churches back home. It lasted around 5 years or so, and then, as all revivals seem to do, the fire faded to coals that hopefully sustained a heat in the churches that, if not as searing, would be longer lasting. It exploded, it burned, and it faded. Steve went on to other things around the world, still a firebrand for winning souls, but he contracted cancer five years ago and died last week. Having left the center stage of the Miraculous and Exciting, he had no longer been the darling of the evangelical world, but a slowly fading name amongst his own denomination, and barely recognizable outside it. For me, Steve was a contemporary, so I did not hold him in awe as so many of the younger generation had. He was one of the guys who preached the same message I did and came from the same roots. We came out of a generation that could see the difference between the Old Fashioned Gospel that birthed us and the new Love Gospel that the modern church has become so enamored with. But there are fewer of us all the time. Steve Hill, David Wilkerson, Leonard Ravenhill, and scores of other ministers of fire who preached the Fear of God, did not shrink from painting a picture of Hell in great detail, and demanded holiness and righteousness in our walk with God. There was a difference in their message and a difference in the tenor of their voice – something that is lost on this generation because most have never heard what a message “under the anointing” is like. Gone. One after the other, they are gone. In their places are polished theological wannabes who faithfully listen to messages on SermonIndex.com so they can copy them and try to mimic the fire and thunder of the past. But the anointing cannot be mimicked or copied – it has to be gotten from down on your knees on the valley floor where your spirit is broken, crucified, and wrung out before Almighty God. It is in complete contrast to the culture of microwave faith and the impatience of this instant, digital generation. Another revival is coming, but it will not come through a sophisticated modern church but from the cries of a new Gideon Generation. The prophet Joel spoke of an army that would rise just before the Day of the Lord. Rude, crude, outrageous, and on fire, they will rise up with the spirit of Elijah to declare the final coming of the Lord. It will be “Repent or Perish!” all over again. And Steve – and the others – will be cheering them on. We had two days of crusades in a remote area of Uganda where somewhere between 400 to 500 souls gave their lives to Christ. This was a witchcraft-dominated area where satanic worship had a stranglehold on these people and where no churches have been able to survive. We were not sure how the battle would go, but we knew the power of God was more than capable of expelling the darkness. Not only that, but these people were starving for the Light. When satanic darkness covers an area or a town, there is a sense of oppression on everything and there is a satanic grip on people’s souls that will not allow them to escape. Only the power of God can break it. But the people have to want it in order for it to work. We had preaching from Evangelist Daniel Norris and myself and we showed the Jesus film in the evening. Deliverance had come, Truth shone, and souls were saved at each session. And from what I have just heard, they are still coming. Two days later, the people are still there and don’t want to leave because the Spirit of God has covered that place. A church has been birthed in the midst of the darkness and liberty has been declared where chains had once held these people captive. I gotta tell you, we are having lots of fun. But there is one story I’d like to share with you before I close. Often there will be one particular person that puts an exclamation point on the whole crusade. For this one, it is an old man who crawled in during one of the messages. It was obvious that this guy was either drunk or crazy, but I couldn’t tell which. He seemed harmless sitting there in front of everyone, scratching at the grass around him. And then I felt the Lord direct me to lay hands on him and cast out the devils in him, and if I did not, they would kill him. Uh, are you talking to me, Lord? Am I imagining this? I mean, it wasn’t like I heard the voice of God or anything – just a real strong feeling that gripped me inside. Okay, so what’s the worst that could happen? After all, I have done this before more than once, and it is all very real. Especially out here in this satanic hellhole. So I did. And yup, you guessed it, as soon as I laid hands on him, a battle started between me and the demons inside this guy. After a while, they would calm down as if he was going to sleep, trying to fool me into thinking they were gone. But when demons come out, you can feel the release and there had been no release. As soon as they realized that I wasn’t fooled, it would start up all over again. This went on for a long time (don’t know how long), but when it was done, it was done. I could see the massive scars on his head, neck and body from where he had been cutting himself and would have continued until he had killed himself. Just like the Lord had told me. It turns out, this man had been possessed for years from a witch who had cast spells on him – a long tormented story. He was a demoniac like what met Jesus at the Gadarenes. Now he is at the church, saved and in his right mind, ready to serve the Lord. Light. There is no telling how many souls will be saved from the testimonies of not only this man, but of the hundreds of people who experienced the liberation of the power of Salvation in their little town. There’s a lesson here about surrendering it all to God and believing that if you will just step out in faith, you will see God move. But you have to be willing to give it all to Him and let Him do whatever He will do. And when you do, He will meet you at your faith, and you will see miracles. If you don’t step off the edge of the cliff, you will never learn how to fly. What a Service We Had! What a day we’ve had! Cindy and I are on a 10-week tour of 4 different countries here in Africa. We’ve come to Uganda to install an Internet-based system for me to be able to preach live over Skype to a projector wherever Noah, my partner here in Uganda, wants to set it up. This would enable us to preach in many of the remote villages here that no one ever visits. It also enable us to show videos like the Jesus Film as an evangelistic tool to win souls. We tried it out last night in an outdoor crusade around the local church. We set up outside in the market area and people came from everywhere to watch the film and listen to the preaching. 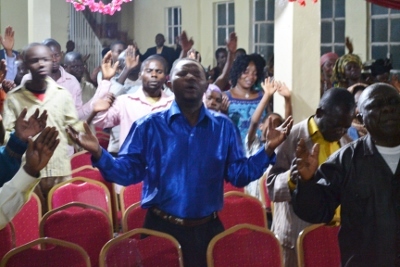 Dozens came down at the altar call. Most of them were kids, who will come down anytime you call them, so it was hard to say how many people actually came down to the altar to give their lives to Christ but there were plenty. The next day was Sunday. I joked with Daniel, the brother who came to install this projection system, that services can last a couple hours here. They lasted for four. It started out the usual way – lots of singing and praise. Africans love music, singing, and dancing. Give them an opportunity to sing and they will raise the roof! As I got up to bring the message, I could feel the energy and excitement begin to roll. I felt like I had just my finger in a socket and plugged myself in. Again, scores came down to the altar to pray. They are so hungry to see a move of God, not only in their church and their country, but in their own personal lives as well. Crying out to God, they lined up 4 and 5 deep in front of the altar. How do you put a measure on passion like this? I can deliver the same message in America and barely get a stifled yawn. Maybe some amens and some ataboys, but no impassioned repentance or broken hearts to turn from our complacency. We are going to miss this coming move of God if we do not allow our hearts to be torn wide open. But services were not finished. A few more songs and then the pulpit was opened for my companion, Daniel to preach. Daniel is a much in-demand evangelist with the Steve Hill Ministries, and wow can he preach! 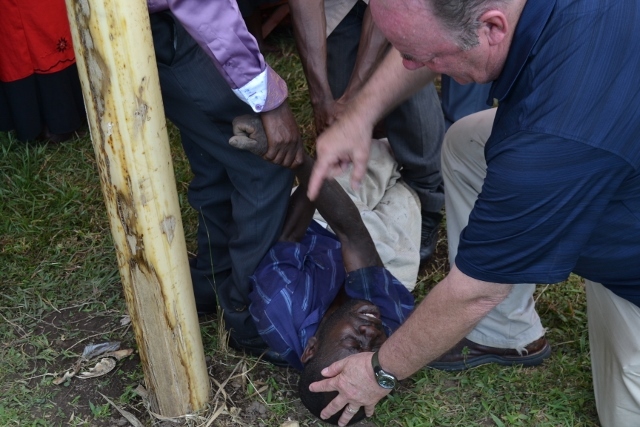 Excitement rose again and people came down to receive the Holy Spirit. You could hear us a mile away as the passion rose, hearts broke open, and the Spirit of God dealt with these people. After it was over, everyone felt as if they had gone through a wash and rinse cycle. You felt clean and drained. Tomorrow, we start in a village and hour away in which there are no churches because the witch doctors have chased them all away. Any attempts to plant a church there has been threatened, burned, and hammered with satanic curses. Pastor Noah, our host in Uganda, has contacted the churches in all the surrounding areas that we are coming and asking them to join us there. We are about to establish a stronghold for God in the midst of this darkness and they are coming to be part of it. This is war and this is how we fight. Satan, take notice. We are about to rip your black grimy fingers from off these people and break forth with the blinding Light of Jesus Christ in an area where you have never before been challenged. You can scream, you can rant and rave, but you can’t win. We claim the victory in the name of Jesus Christ and by the power of the Holy Ghost and we will establish a landmark for God that you will not soon forget.